I’ve begun reading for pleasure again, which is a good sign that the dark cloud of the last few months is beginning to lift. Actually, the dark cloud has been more like a clinical case of anxiety and depression. (Keeping it real here, folks.) I’m slowing digging my way out, and Helen Fielding’s newest book, “Bridget Jones: Mad About The Boy” is helping. To say I love the Bridget Jones books would be an understatement, and the movies are as comforting to me as my mom’s matzo ball soup and falling asleep on the couch. In fact, if it weren’t for this parenting gig that generally prevents me from being anywhere near the couch except to vacuum crumbs, I probably would’ve been watching “Bridget Jones’s Diary” on an endless loop on the couch since mid-September. Christmas was a mixture of magic and truth. The magical part was obviously the kids’ delight. Riley pitter-pattered into my bedroom around 3:00 a.m. on Christmas morning (after peaking in the living room first) and whispered in my ear, “Mommy, guess what? Santa was here.” Experiencing Christmas through my children’s eyes was a gift, but it also revealed a hard truth: Christmas is for kids and the rest of us are just sitting around thinking about who isn’t there, who is there but might not be for much longer, how excessive it all feels, and how after an endless build-up, it will be over as quickly as it started and the rest of the day will be messy and long and sad. Here’s another truth. I think too goddamned much. In an effort to stave off a frothy wave of new thinky sadness and ruin the rest of the season for everyone, I’m going to harness my inner Bridget Jones and tell you a happier story about a blender. Operation Santa Claus is great success! Kids are happy and we don’t require a bigger house due to (a) retractable toys (a Hot Wheels track that rolls up like a pillbug), (2) outside toys (sidewalk chalk that attaches to scooters), (3) non-toys (Iron Man and Lightning McQueen blankets), and (4) toothbrushes. Colorful, light-up toothbrushes make kids swoon as much as extra-large plastic batcave and pirate ship! 1. Buy and hide Santa-only gift wrap, as first words uttered in living room at 6:30 a.m. were: “Santa has the same wrapping paper as us!” Oops. 2. Buy only retractable toys and toys that live outside, so house will not be swallowed by plastic crap made in China. 3. Buy floss, socks, frozen peas, and math workbooks. If wrapped in Christmas paper, children will swoon! 4. Drink less wine on Christmas Eve so as to prevent 6:30 a.m. headache. Husband has outdone himself. Of all the romantic appliances he’s gifted to me over the years, this one is effing brilliant. He did the unthinkable, the unimaginable, the beyond my wildest dreams impossible. He bought me a Vitamix Professional Series 750. Clearly, I don’t deserve this remarkable, uber-powerful, uber-expensive blender of good health and well-being that makes frozen mixed berry sherbet and hot cream of asparagus soup with the flip of a switch. Wait! My dog died and I got cancer on my face. I do deserve it. I do! 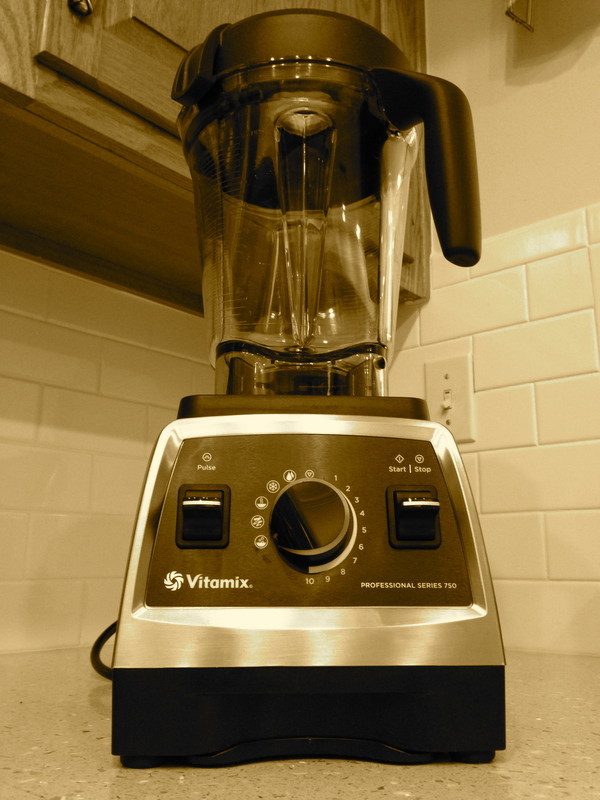 This brand new, totally gorgeous, brushed stainless steel Vitamix will completely transform my life, and because we’re all connected, it will reverberate around the globe. In fact, the entire universe will be transformed by my new blender mega-magic-mixing-machine. Note to self: Gut and renovate entire kitchen to match stunning mixing contraption. Must purchase buckets of organic fruits and vegetables and immediately mix up amazing smoothies that will change world (and remove Hanukkah Thanksgiving Christmas bloat). Smoothie made with pineapple, apple, grapes, orange, cucumber (a vegetable! ), and carrots (another vegetable!) is divine. New house rule: Everyone must try every smoothie! I taste it. It’s delicious! Husband tastes it. It’s heavenly! We immediately look years younger and ooze vibrance. Seven-year-old picky eater tastes it. He actually tastes it! Then he heaves and spits it all out in his hand. Upon witnessing this gross act, four-year-old little brother bolts to patio and hides under table. Note to self: Never let a picky eater taste new food first. Will make homemade peanut butter and it will be brilliant! There will be no preservatives, oils, or sugars. Everyone will go nuts (pun intended! ), and we’ll never have to buy store bought peanut butter again. Will save tons of money, which is good thing, because mega-magic-mixing-machine cost more than small car. Gaa! Picky eater consumes a spoonful of luscious, homemade peanut butter and gives thumbs up. Vitamix will transform our lives. Investment will pay off in mere weeks months years! After eating one bite of homemade peanut butter sandwich, picky eater proclaims, “It tastes weird.” Begs for store-bought peanut butter instead. Bugger. Will eventually convince children to love homemade mega-magic-mixing-machine peanut butter, but in meantime, have just whipped up the most delicious kale and basil pesto. Literally just whipped it up! Cannot believe how frangrant and green and delightful it is. Dinner is perfection. Should be photographed for glossy foodie magazine. Orange, pineapple, and apple smoothie to start day. It’s marvelous. Picky eater tastes and likes it, but won’t drink it. Confusing little bugger. Little brother hides again, but takes pride (under table) in that he pressed the “start” button on mega-magic-mixing-machine. Have marvelous idea! Will bake peanut butter cookies using freshly made peanut butter that no one will eat. As New Year approaches, must make list of to-die-for mega-magic-mixing-machine recipes to mark a glorious future of health, well-being, skinny jeans, and smooth skin. Musn’t forget to make resolutions for 2014. Gaa! 3. Think about sad, thinky stuff less. Read (more), blend (more), think (less) transformation in full force. Year ahead will be stellar all due to being totally and completely mad about the blender. p.s. Thank you, Bridget Jones, for your friendship, distraction, and inspiration. p.p.s. Thank you, Mike, for giving me the best Christmas gift ever. p.p.p.s. Thank you, Vitamix, for giving me something to do besides wallow and think…and think and think and think (and for having the ability to self-clean with the flip of a switch). p.p.p.p.s Thank you, dear friends and readers, for indulging my desire to tell you a story about a blender. Re: Santa-only wrapping paper…my husband mocks me for buying and hiding the Santa paper every year…now I have proof I’m not alone in trying to maintain the magic! Happy New Year! My husband (ummmm, also named Mike, go figure) gave me a Vitamix for Xmas about three years ago and I love, love, love it. I love it so much that we even took Vilma with us on our New Year’s vacation to Gatlinburg last week. (I told you I love it!) Anyway when I am not reading your blog I am sometimes a coordinator for a Florida-based organic produce buying club and have been for three years. I love my produce as much as I love Vilma…I get a fresh box of all organic produce every other week at wholesale prices. While I would love having you pick up from my location (I am close to the zoo) I don’t think you are really close to me to make it convenient for you…but I am sure there is a good coordinator near you as the owner has locations all over Florida. Some locations are weekly and some are biweekly so you can decide if you want a box every week or every other week. Plus there are tons of different box combos to choose from. Anyway…if this is something you want to try you can email me and I will give you some details and help you pick out a location close to you. There are no membership fees…no commitments…and she also has organic milk and eggs if that is up your alley.